In the halls of the academy, data suggest that conservatives are both more underrepresented and more heavily discriminated against than most other traditionally underrepresented groups (though other groups certainly may face greater barriers before they get to the academy). To kick off this week’s #DiversityJC discussion, here are some thoughts on why this is a problem for academia’s equity, research quality, and public trust, and what we might do about it. A recent New York Times op-ed by Nicholas Kristof has drawn a lot of attention to an issue a few people (myself included) have been talking about over the last few months: academia’s conservative problem. Specifically, conservatives (and evangelical Christians) are severely underrepresented in the ivory tower, at least partly as a result of discrimination, studies suggest. The kind folks at #DiversityJC (an online forum for discussing diversity issues in science, technology, engineering, and mathematics [STEM]) are hosting a discussion of this issue on Twitter tomorrow (Friday, May 20) at 2pm Eastern (using #DiversityJC), and have asked me to provide a comment. I look forward to participating in this discussion and I hope you will join me. First off, it is worth mentioning that I am not conservative myself; in fact, compared to the general public I am quite far to the left on most issues (as I have often demonstrated in this forum, e.g. see here, here, here, and here). I mention this for two reasons: (i) to head off any accusations–such as others have faced–that I am raising this issue for self-serving reasons (i.e. ‘Hire me, I’m being discriminated against!’); and (ii) because I believe my outspokenness (and that of other liberals) on this issue is indicative of the issue itself: conservatives in academia are so scarce and so far underground that they need liberals like me to defend their basic rights to equal opportunity and free expression. But enough housekeeping, let’s get to the questions at the core of this discussion: 1) To what extent are conservatives underrepresented and discriminated against in academia? 2) To what extent should we consider this a problem? 3) What should we do about it (if it’s a problem)? 1) To what extent are conservatives underrepresented and discriminated against in academia? According to the most recent Gallup poll, 37% of American adults identify as conservative (35% identify as moderate, 24% liberal). According to a recent survey of public and private U.S. universities, only 9.7% of full professors (and 11.2% of assistant professors) identify as conservative. Conservative numbers are slightly lower if we exclude religiously affiliated universities. At every rank, conservative professors are outnumbered by those who identify as ‘far left’. Some fields have more of a liberal slant than others, with the greatest disparities found in the non-economic social sciences and the humanities (where in some fields Marxists outnumber Republicans by margins of 2:1 or greater). How do these numbers compare to those of other traditionally underrepresented groups? The chart below compares the underrepresentation of conservatives to that of six other traditionally underrepresented groups among U.S. college and university professors (both at the aggregate level and only including full professors)–where underrepresentation of group X is measured by the ratio: % of professors in group X/% of public in group X. Using this measure, only Hispanics (and African American women at the full professor level) are more underrepresented than conservatives (and these data even include the relatively pro-conservative religious universities). 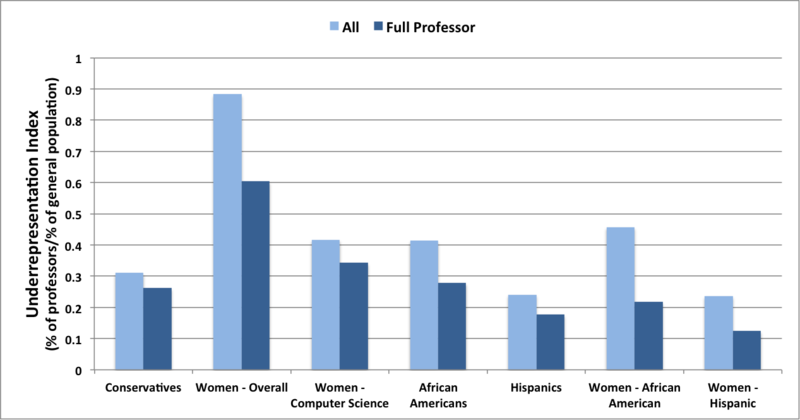 Strikingly, conservatives are now more underrepresented than both African Americans and women in computer science (one of the most male-dominated fields) at every professorial rank. Comparing underrepresentation of U.S. conservatives as professors with other underrepresented groups. Data sources: Inside Higher Ed, National Center for Education Statistics, NSF, Gallup, U.S. Census. On its own, does this imply discrimination against conservatives? Not necessarily. While it’s certainly suggestive (similar representation statistics are often cited as evidence of discrimination against other groups), it’s theoretically possible that the underrepresentation of conservatives in academia is simply a result of conservatives and liberals making different choices. Similar arguments have sometimes been made to justify women’s underrepresentation in STEM (or men’s in nursing and education), for example. However, there is evidence for discrimination against conservatives in academia. For example, a survey of social psychologists found that 37% reported willingness to discriminate against conservatives between ‘somewhat’ and ‘very much’ (4-7 on a 1-7 scale, where 1 is ‘not at all’) and 82% of those identifying as liberal reported that they would discriminate against conservatives at least a bit (i.e. they did not report 1). In another survey, %50-60 of English professors reported that they would discriminate against an evangelical. An experiment involving the selection of scholarship winners found both liberals and conservatives to discriminate much more heavily against each other than they would discriminate based on race. The existence of discrimination doesn’t necessarily imply that discrimination–rather than choices–explains all of the underrepresentation, but it most likely explains some of it. Moreover, discrimination affects choices. If conservatives feel they are unwelcome in the academy, that may influence their decisions to leave or not enter (this point, too, has been made before in the context of women’s underrepresentation in STEM). 2) To what extent should we consider this a problem? The data suggest that conservatives are: (a) one of the most underrepresented groups in the academy (see chart above), and (b) that they face discrimination on a scale that may be comparable to or even greater than discrimination based on other aspects of identity (e.g. race). From the perspective of equity/equal opportunity, it should go without saying that this is a problem (and the data suggest it’s a big problem). However, I would go further and say that academia’s conservative problem also threatens the quality of and public trust in research. Research quality: Each person has a slightly different set of knowledge, experiences, blind spots, and biases. That is why both diversity and a free marketplace of ideas are so critical to high-quality research. Members of diverse disciplines enhance each other’s productivity by challenging each other’s assumptions and biases, and by exchanging among their complementary information sets. This process is not always comfortable, or even cordial, but it often leads to some of the most important advances in a field. Examples of this from my own fields include the Hilborn-Worm debate on the status of fisheries, and the new vs. old conservation debate. Others have described the many ways ideological concentration within a discipline can threaten research quality (e.g. here and here), so I won’t go through these exhaustively, but I’ll briefly mention two: pseudo-replication by echo and evidence taboos. Pseudo-replication by echo happens when a single study, finding, or statistic gets so much attention and citation because of its support for the dominant ideology that it becomes mistaken in the public discourse for a well-replicated axiom of science, even if the study is disputed or later overturned. Alleged examples of this include: (i) some of the statistics suggesting a dire status of global fisheries (e.g. 90% of top predator biomass has been depleted, 70% of stocks are overfished) that continue to be cited widely in scientific and public discourses (e.g. here), despite being overturned, in some cases by the original authors themselves; and (ii) the statistic suggesting that 1 in 5 college women is sexually assaulted, which continues to dominate the public discourse, right up to the White House, despite coming from a 2007 study that has been criticized for having a non-representative web sample, a low response rate, and for using a more expansive definition of sexual assault than the legal definition; a follow-up 2013 study by the federal Bureau of Justice Statistics estimated the number to be closer to 1 in 50 (which, to be clear, is still far too high), but the debate (and the fact that there is a debate) has received relatively little attention. Evidence taboos are pieces of evidence that researchers are ostracized–on ideological grounds–for merely seeking or discussing. Probably the best-documented example of this is the taboo around research on genetic determinants of human behaviors and aptitudes (researchers have often been accused of racism and sexism for any type of engagement in this topic); Steven Pinker details this taboo–and its adverse consequences on the quality of research in psychology and many of the social sciences–in his book The Blank Slate. Public trust in research: If we systematically exclude conservatives from the knowledge-production process within the halls of the academy, we should not be surprised when conservative governments cut our funding, or when conservative politicians and citizens doubt even our most well-supported findings. Ironically, liberal scholars seem to understand this principle quite well when it comes to working with stakeholders in other countries; in these contexts knowledge ‘co-production’ is often cited as important for effective governance. The principle in our own societies should be no different. At a time when we desperately need public trust in science to tackle big societal challenges (e.g. combatting climate change, feeding 10 billion people), we can’t keep pushing conservatives away (even if some of them are pushing us away also). 3) What should we do about it? If we can agree that conservatives are both underrepresented and discriminated against in the academy, and that this is a problem, what should we do about it? Some have argued that conservatives should receive affirmative action (i.e. being conservative would be weighted positively in hiring and promotion decisions), much like other underrepresented groups receive. I’m not sure I agree, for three reasons. First, conservatives are a diverse group, and the conservative-liberal distinction is not always easy to make. For example, arguably Trump supporters have more in common with activists in the so-called ‘regressive left‘, who share their eagerness to stifle the basic civil liberties of their political opponents, than they do with right-wing libertarians. Second, putting in place explicit affirmative action for conservatives promotes people putting themselves into political boxes (rather than forming opinions on each issue independently), which is the opposite of what we should all be doing as objective, intellectually curious scholars. Third, I am generally skeptical–as I have noted before and will expand on in the future–of identity-based (race-based, gender-based, political affiliation-based, etc.) affirmative action when alternative interventions are available that directly target the barriers facing the identity group. Identity-based affirmative action tends to disproportionately benefit those in the targeted identity group who are least impacted by the barriers. For example, many have argued (e.g. here) that benefits of affirmative action in many facets of society have disproportionately gone to white, affluent women. If we instituted affirmative action for conservatives in academia, my guess is most of the benefits would end up going to moderates (or liberals like me who have written blog posts like this) who don’t currently face most of the barriers described above. Additionally, because affirmative action benefits those most who need it least within a group, it also tends to create incentives for groups to fracture in order to form sub-groups that can claim greater aggrieved status–and therefore higher priority for affirmative action–than the larger group. Examples of such fracturing have arguably been seen in both women’s and LGBT-rights movements in recent years. Therefore, if we instituted affirmative action for conservatives in academia, I wouldn’t be surprised to see declines in solidarity among conservatives. Adopt explicit policies on campus (and at academic conferences, etc.) prohibiting discrimination on the basis of political ideology or affiliation (e.g. in hiring and advancement). Given how normalized and accepted this type of discrimination seems to be, an intervention this simple would probably have a surprisingly large positive effect. Even if the effect was only symbolic for conservatives inside the academy, it would still send a strong message to conservatives outside the academy, which could begin to restore public trust. Moreover, if universities or departments put such a policy in place but didn’t follow it, there would surely be lawsuits, which would eventually increase compliance. Renew our commitment to (true) liberalism. This may seem like a strange recommendation in a post about liberal overrepresentation in the academy, but actually the discrimination, biases, and taboos that push conservatives out of the academy go fundamentally against the tenets of liberalism. Liberalism is supposed to be about equal opportunity, rights to self-determination, and free exchanges of ideas. If we renewed our commitment to these values, we would discriminate against conservatives much less. Renew our commitment to critical self-reflection. Given how much modern universities invest in increasing diversity and reducing discrimination, it’s pretty shocking that we’d be so hypocritical when it comes to our political opponents. Indeed, the importance of critical self-reflection (with respect to our biases and privilege) is a fundamental axiom of the ‘critical theory’ upon which most campus social justice activism is based. Let’s start practicing what we preach. Adopt systems that reward learning, as opposed to being right–scientific process over outcome. Part of the reason, I suspect, that academia has become so hostile to ideological diversity recently is that we’ve created an academic culture that simultaneously rewards flashy results above all else and punishes mistakes and overturned findings mercilessly. Both of these create incentives to cut corners and avoid settings in which we are likely to be challenged; we tend to be more often challenged in ideologically diverse settings. A scientific reward system that promotes asking good questions, designing rigorous studies, and learning from–which necessarily involves making–mistakes would be beneficial. In fact, there are many, many reasons we would want to transition to such a reward system, beyond inclusion of conservatives, and it is being increasingly called for (e.g. here). 1) Many have commented to the effect of “Political ideology is a choice, not something you’re born with, so you can’t compare discrimination based on political ideology to discrimination based on race or gender.” That’s absolutely a fair point, but it does not separate discrimination based on political ideology from discrimination based on religion (both are arguably choices, and also arguably heritable to some extent, according to some studies). So if we’re ok with discrimination against conservatives, I think we have to also be ok with discrimination on the basis of religion. Are we? The religion-politics comparison also applies to another type argument I’ve heard a few times “if conservatives didn’t want to be discriminated against, they shouldn’t let the wackos speak for them.” This type of argument is analogous, for example, to what people like Ann Coulter say about Muslims. 2) Someone shared with me an article, which was published Medium a few days ago, that calls into question one of the studies Kristof cites in his NYT piece (as out-of-date and contradicted by the same authors in a newer version and their book): https://medium.com/@ginasue/the-lie-of-liberal-intolerance-on-campus-6ba4c67ea8e0#.nentdt6vx This article has some good counterpoints in it (especially in relation to the one study mis-cited by Kristof); and it also draws attention to the fact that the chasm between conservatives and the academy has been driven as much by conservatives outside the academy as liberals inside it (this is documented, for example, in the book The Republican War on Science: http://www.waronscience.com/home.php). However, the article also understates the larger body of evidence demonstrating political discrimination in academia (see http://heterodoxacademy.org/publications/), and some of the numbers it cites (e.g. conservatives being represented at 1 in 5 in the academy) are themselves out-of-date, see: https://www.insidehighered.com/news/2012/10/24/survey-finds-professors-already-liberal-have-moved-further-left, which suggests it’s more like 1 in 10 (those are the numbers I used in the chart shown in this post). 3) The same Medium article suggested that calling attention to conservative underrepresentation and discrimination in science is dangerous because it fuels the already raging anti-science fire in some conservative circles. That may be true to an extent, but given that there is genuine discrimination, my guess is letting it fester and worsen is going to fuel the anti-science fire even more in the long term. Nothing puts out a fire of moral outrage like an olive branch. Anyway, look forward to continuing the discussion!